IDK who we think we are, but we are no longer spring chickens! 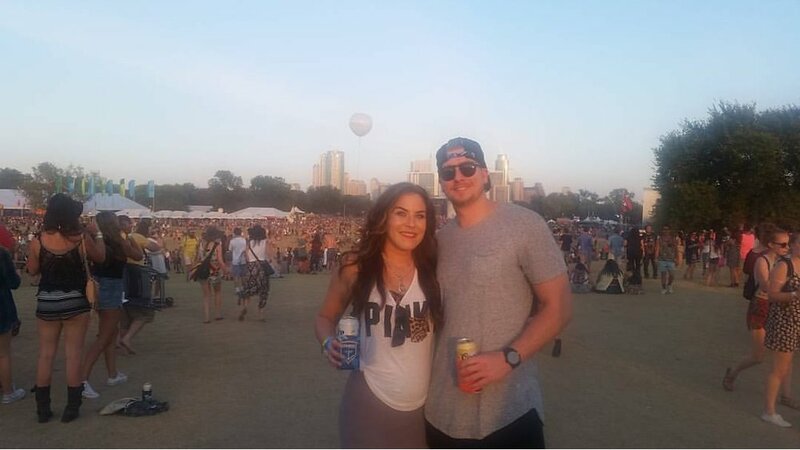 We bought 3-Day wristbands for Weekend 1 of Austin City Limits Music Festival (ACL), and I’m already regretting my poor, FOMO-driven decisions. This will be my fourth year attending the festival, and I’m already tired. If you’ve been following along on Instagram Stories, you know I’ve been a hamster on a wheel lately. But, I digress. We’re going. All three days. Let’s make it happen! I thought there no better time than the present to share the knowledge I’ve picked up over the years, and what my top picks and hangs will be for this time around. Here’s the thing. You NEED to eat at festivals. Duh, right? But, when you’re hopping from stage to stage, it’s easy to forget. If it’s like years past, we’re all going to be baking in the hot sun for hours on end. You need to keep your body fueled (and hydrated). Basically, you need to eat a filling meal, so that you’re not standing in line every hour for a snack - missing valuable music time! Below are my top picks for meals and snacks this year. FLYRITE - I’m SURE they’ll have some of their DELICIOUS chicken sandwiches - which are perfect, handheld food items. Snag your sammy and find some shade! FRANK - Again! Quick, easy, delicious hot dogs perfect for bouncing from stage to stage. I hope they have their pretzels too because they are a must-have snack! CHI’LANTRO - THE KIMCHI FRIES! You’ve heard about them, and YES you must try them. They are totally a meal themselves because they are so filling. Their website describes them as “your choice of protein, caramelized kimchi, cheddar + monterey jack, onions, cilantro, magic sauce, sesame seeds, sriracha on a crispy bed of french fries”. JUICELAND - An Austin staple. Also, juice keeps you hydrated when the sun has no mercy! Not sure which ones they will have available, but for me, as long as there are no beets - it’s considered a winner. HIGHBREW - This is hands down my favorite canned cold brew made right here in Austin. I love the “Black & Bold” variety. No sugar. Just caffeine, baby! MMMPANADAS - Portable deliciousness wrapped in dough. They even will be offering gluten-freen and vegan options. Empanadas make a perfect snack. There will be drink stations all around the festival. But, here are some fun places to check out. Also, don’t forget the H2O - especially if you’re traveling from out-of-state. The quickest way to ruin your festival experience is dehydration. ACL WINE LOUNGE - This setup will be located right behind the Homeaway stage for reference. It is sponsored by Campo Viejo and will feature lots of fun drinks like frose and spritzes all under some shady delicious oak trees. BLESS! BARTON SPRINGS BEER HALL - Love sports and music? Not to fear. Between sets you can catch your favorite teams play on the jumbo screen and wash down the win with a cold brewski. There is actually a ton of fun things to do within ACL beyond the main stages. Lots of brands will be out repping and doing giveaways and handing out free swag. SILENT DISCO - Sometimes you just wanna dance. Each day of the festival head to the Tito’s Handmade Vodka Stage from 8-10pm. You’ll be given a special ACL Fest-supplied pair of headphones and can groove to three DJs. ART MARKET - Separate from the ACL Merch tent, this area offers goods and wares from artisans from all over the world. Some merchants to check out are Austin Art Garage and Teysha. Rain is in the forecast for Weekend 1, and it’s usually HOT! My best piece of advice is to wear comfortable shoes you don’t care about getting dirty. The dust or mud is sure to happen and you might as well be prepared to get gross. A rain poncho can’t hurt if it does rain. Usually they fold up really small, so they can fit in your bag easily. Speaking of bags, KNOW THE RULES - which you can find HERE. Not all bags are permitted, so don’t be that person at the gate! Lockers are available near the front of the festival if you want to pay to stash your stuff and not haul it around. Don’t forget a hat and sunscreen! Otherwise, I’m no fashion blogger. Wear what makes you feel happy, mmkay? The sunscreen I’ll be wearing this weekend is Coola Sport Face SPF 50 White Tea Organic Sunscreen Lotion. Pricey, but your skin is ALWAYS worth it. Don’t be me. Don’t wear a sweater! I think it was “kind of” cool, but the sun roasted me! Screenshot the lineups / stages because it will save battery power on your phone if you’re just looking at your image gallery - versus loading up the page every time you need it. can’t hail a cab or call an Uber. Speaking from experience - unfortunately. Save your name and alternate number or contact information on your lock screen. If you lose your phone, you have a better chance of getting it back quickly this way. Bring an empty water bottle to refill with water once you’re inside the festival. You cannot enter with any liquids in your water container, but on the map linked above you’ll see Camelbak Hydration Stations scattered about the park. Register your wristbands, so you can go cashless! All your wristband questions can be answered HERE! Who are you looking most forward to hearing at ACL? I’m looking forward to hearing Paul McCartney and Khalid. Low key one of my favorite parts of Austin City Limits is all the “unknown” (at least to me) artists because I’ve found some really great music just by listening to some of the lesser known acts. So, that’s what I’m looking forward to MOST. If you see me at ACL, please come say “hi”. I may barely be functioning or spazzing out on caffeine to keep me awake all weekend. But, I promise you I’d love to meet ya! Hope you have a fun, safe ACL Fest! WEDDING PLANNING WEDNESDAY: ENGAGED, NOW WHAT? !